Cinderelleper is the name given to her by her evil stepmother. Cinderelleper is diagnosed with leprosy early in the story and this is the take-off of the well-known fairy tale. We’ve all seen the memes spoofing with the Prince on the internet, “Says you are the love of his life. Forgets what you look like and has to put a shoe on every girl in the kingdom.” Forkum takes that common sense sarcasm to an extreme by writing a story more in the spirit of the dark and dangerous Grimm fairy tale than the world of helpful mice and unfettered optimism of the Disney version. His story is tongue-in-cheek and it is told with respect to the depth of the material by folding it to expose the core. 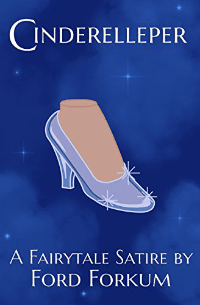 Cinderelleper features the irredeemably cruel and ambitious evil stepmother and the hyper-critical, evil stepsisters. Rather than the implied haughtily cruel eyebrow of the animated version, Forkum’s version is borderline homicidal and the stepmother is out for her own ambition with her daughters as pawns in the pursuit of never having to lift a finger. For her part, Cinderelleper is circumspect about the circumstances leading her to enslavement that staves off that sense that she’s a battered and broken victim. She has no plans to advocate for the hand of the feckless prince, but she’s been given a mission that makes sense for the good of the kingdom and is willing to carry it out. The humor of Cinderelleper is sometimes quite elementary but it is clearly a callback to highlight the nonsense of (mostly) the Disney version. Mice as drivers? The fairy godmother’s magical chant is reminiscent of something the Simpsons would do, so as not to be sued by Disney (see their spoof of Snow White). At a light 43 pages, the story is pretty straightforward and generally close to the key events of the Disney version with enough of a digression that though the framework may resemble the progression, the characters, motivations and end results are completely different. There are moments of brilliance in the piece that really led to reflection beyond the page. There are lessons in Cinderelleper. Technically speaking, the novella is perfect. There are no formatting or general errors. Cinderelleper is a fun and fast read that whether you’re a fan of fairy tales or live to hate them, you’ll enjoy. Pick it up today. If you enjoy wacky humor, read our reviews of Ford Forkum’s Alien Invasion of the Zombie Apocalypse, Beers in Heaven and Snow White and the Seventeen Dwarfs: A Fairy Tale Satire. For more information about Ford Forkum and his work, visit his His Beer in Heaven website. You can connect with Ford Forkum on Goodreads, Facebook, Google+, YouTube and Twitter @FordForkum.